As a hardware device, the sat nav may be on the way out, but its spirit lives on in the apps you can get for your phone - apps designed to guide your car safe and sound to your destination in the quickest possible time (or via the cheapest, toll-free route, if you prefer). With features such as live traffic updates, lane direction and spoken turn-by-turn instructions, these apps are getting more advanced all the time, and often putting integrated sat nav systems to shame. Here are seven of our current favourite picks. Apple Maps may have caught up to it to some extent, but Google Maps has been leading the way in sat nav technology for some time now - remember when it introduced turn-by-turn directions in 2009, free of charge? It was a huge move for the time. With no need to download maps in advance and up-to-the-minute info at all times, the feature was a revolution. Nowadays, Google Maps remains a slick and stable navigation app, with live traffic updates, offline caching, a wealth of routing options and more. Despite a less-than-stellar introduction to the world in 2012, Apple Maps now goes toe-to-toe with Google in many areas, including the built-in navigation capabilities. It'll get you where you need to go and give you plenty of useful information along the way. In the most recent iOS 10 update, Apple introduced live traffic updates, an easier way to check ahead on your directions, and the ability to search for food and petrol stops en route (a feature also available in Google Maps). It's only for iOS devices though, of course. Here WeGo (previously just Here Maps) has quietly been making a name for itself away from the glares of attention directed at Apple and Google, and has pioneered several handy features borrowed by others - such as the option to download maps for offline use. It has everything you would expect from a navigation app and then some, with live traffic updates and automatic rerouting if there's a delay ahead, plus extra data pulled in from the likes of TripAdvisor, Expedia and Wikipedia to give you a complete map of the road. Now owned by Google, Waze entered a crowded field back in 2006 as a local Israeli project and continues to hold its own. What makes it stand out is its community reporting feature, keeping you in touch with other drivers out on the road while you navigate around. Have you come across some roadworks? Or a hard-to-spot police speed trap? You can get warnings from other drivers inside the app, and warn other drivers in return. On top of that, it has a very friendly interface, plus features like the ability to share your ETA. TomTom is trying to stay relevant in the era of smartphone navigation and its mapping apps are actually very decent indeed (though confusingly they have different names on Android and iOS). You get stacks of features, just as you do with TomTom sat nav devices. Unfortunately you need to cough up for a subscription to get an unlimited amount of travel and extras like live traffic updates, but once you've tried it you might be convinced - advanced lane guidance and speed warnings are among its most useful features. CoPilot is another app that will charge you money for traffic updates past the first year, but to its credit it does come packed with features like speed warnings and detailed driving data. If you're going abroad there's a separate European version to make use of. Maps are downloaded in advance, so losing signal is no problem, and it has detailed readouts on data such as the distance to the next turn and the current speed limit, plus the ability to set up to 52 waypoints for the most complex of journeys. 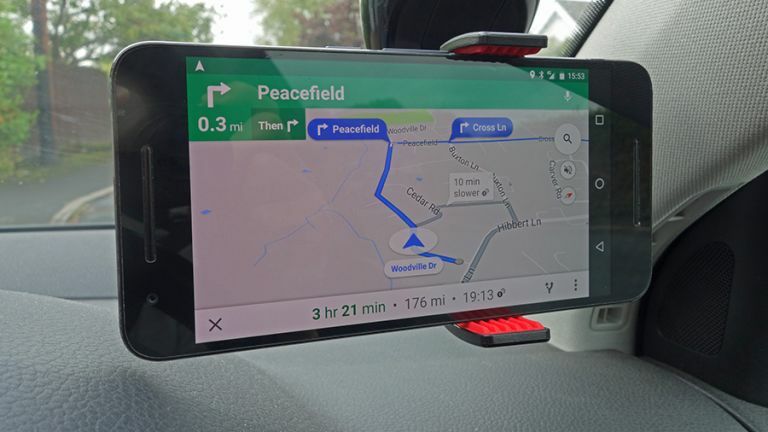 Navmii might not have the cleanest interface of all the apps listed here, but it's still packed with features and information, and well worth a look for the discerning sat nav user. The offline mode, live traffic updates and navigation guidance are all top notch throughout. You get a good overview of where exactly you are in your journey too, and as with Waze you can report traffic delays and accidents to other users. While you can use the app for free, you need to pay to remove the advertising or to download extra international maps.